Flight time 2hrs 20mins from London. 8hrs 35mins from NYC. From a world-famous Opera House in Vienna to the birthplace of Mozart in Salzburg, music is woven into Austria’s identity. Our Europe Travel Experts have been delving deep to bring you a wealth of exclusive experiences such as meeting riders at the iconic Spanish Riding School and cruising down the Danube at sunset. You’ll discover this enthralling country from classic cities to the Austrian Alps, as we whisk you away on a 10-night fairy tale adventure. You’ll stay at some of our favourite hotels, from the iconic Hotel Sacher in Vienna to the charming mountain retreat of Hotel Eder. This really is a trip fit for Kings and Queens, with chauffeur-driven Rolls Royces and a stay in a lakeside castle – so what are you waiting for? Grab your crown (sorry, passport) and let’s go. There is quite simply no better first impression of Austria than Vienna. Unashamedly opulent, from a coffee to a waltz, the Viennese do everything with added panache. In a city as grand as this, there is no more fitting a place to stay than Hotel Sacher. After a quick slice of their world-famous Sachertorte, head out on a private walking tour and discover the Viennese icons that lie just off of your doorstep. An undisputed cultural highlight, tomorrow you’ll visit the Spanish Riding School, where you’ll drop in for a private guided tour of the School and its stables, before an exclusive peek at the morning exercise and a chat with some of the talented riders. Refuel with a Viennese coffee in the traditional Cafe Central before continuing on to the grand Hofburg Imperial Palace and the Sisi Museum, which offer fascinating insight into the private world of the Royal family. No trip to Vienna would be complete without a visit to the legendary State Opera House. Home to the world’s largest repertoire, this is the ultimate cultural experience, but if you’re not much of an opera buff – no problem. Allow your personal butler to hand you a glass of champagne before familiarising you with the programme for the evening. The next morning, take a private tour of Vienna’s most exclusive postcode; the Ringstrasse, before continuing on to another fairytale address: Schönbrunn Palace. The former summer residence of the Habsburg dynasty, the Palace is certainly impressive. For a final dose of Viennese sparkle, that evening you’ll board a private boat and see Vienna from a whole new perspective on a cruise down the Danube. From Vienna, you’ll take a train west to charming Salzburg. Nestled below steep hills, this fairytale city looks much as it did when Mozart lived here 250 years ago. The birthplace of the famous composer, it’s impossible not to fall in love with Salzburg and as you head out on a private guided tour of the Old Town, you’ll take in a backdrop of church spires, mountains and a hilltop fortress that did Maria proud. Music is at the very heart of Salzburg, with every sight having a musical side, and Salzburg Cathedral is no exception. Crowned by a mighty copper dome and flanked by two towers, the cathedral houses an intricate main organ and also bore witness to Mozart’s christening. Speaking of the musical whizz kid, tomorrow, you’ll walk in his footsteps, starting with where it all began – his birthplace. In the heart of the Old City, No.9 Getreidegasse has now been converted into a museum, displaying artefacts from Mozart’s childhood, including the mini violin he played as a toddler. In the afternoon, you’ll swing by the lavish Mirabell Palace & Gardens with its intricate stucco, marble and frescoes where Mozart used to play as a child. Then, out in the gardens, you may recognise this as where the Von Trapp children learned ‘Do-Re-Mi’. 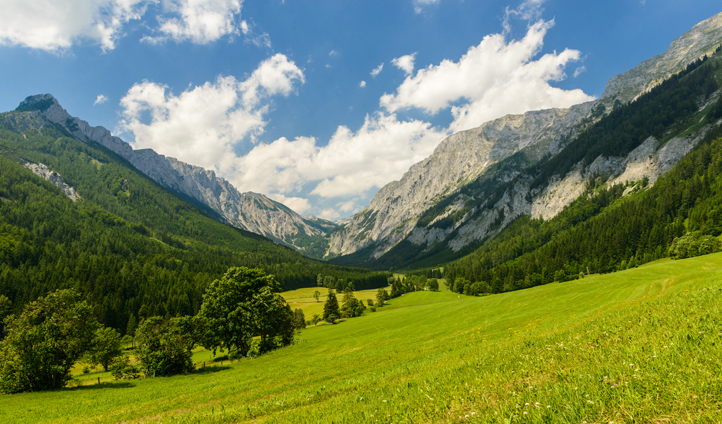 Swap city slicking for mountain climbing as you head up to the Austrian Alps in Hochkönig and spend your days breathing in the fresh mountain air and infectious village charm. Right in the heart of quaint Maria Alm stands Hotel Eder, where urban style meets alpine chic. Take a trip to Eisriesenwelt in Werfen and discover Western Europe’s largest ice cave, with sub-zero temperatures even during the summer. After a day of adventuring, return to Hotel Eder and refuel in one of the three saunas. Bliss. Your final stop in this Austrian adventure is Lake Fuschl, just outside of Salzburg. You’ll be getting the ultimate royal treatment with a stay at the fairytale castle of Schloss Fuschl, where we’ll have you arriving in style in the back of a chauffeur driven Rolls Royce. But before you arrive, there’s time for a quick pit-stop just across the border in the famous Berchtesgaden National Park for a relaxing cruise on Lake Konigsee. 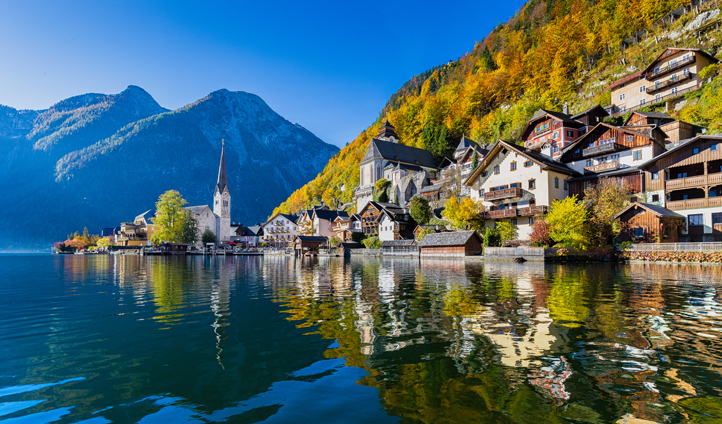 Tomorrow, you’ll head out on a day trip to what is widely considered to be one of the most beautiful lakeside villages in the world; Hallstatt. This UNESCO World Cultural Heritage Region is home to over 7,000 years of history as well as the contemporary skywalk, for stunning views 360 metres above the town. Back at Fuschlsee, you’ll experience the beauty of the Austrian Lake District on a private tour of the local area, armed with a picnic of gourmet nibbles and visiting the towns of St. Wolfgang and St. Gilgen before gliding across Lake Wolfgangsee. All the music, scenery and food of Austria makes for an intoxicating mix and one that we know will leave you besotted with this charming country. For now, your trip ends here – but who knows what you’ll discover next time. A destination for all the seasons, Austria keeps you coming back for more.